Everyone has likely heard of Lean or Six Sigma. 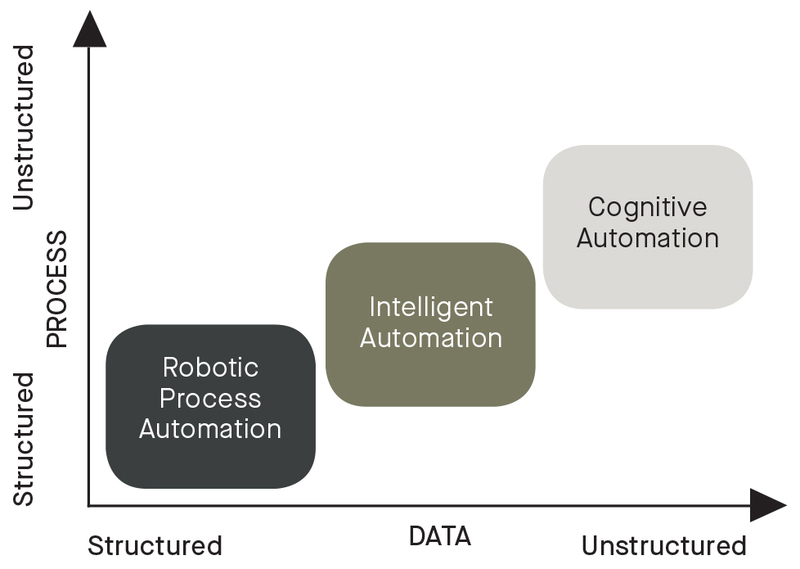 However, in recent years, the ever-growing drive for efficiency has led to the introduction of Robotic Process Automation (RPA), offering companies additional opportunities to reduce costs, streamline processes, and decrease overall time to revenue. With an estimated 45% of an employee’s daily activities being candidates for automation, RPA solutions offer a unique opportunity to replace existing labour-intensive business models with modernized, virtualized, streamlined solutions aimed at maximizing overall productivity. RPA offers your organization the chance to free up its most important resources (your team) to focus on more high-value initiatives and projects. Capable of independently performing simple and complex human-like functions like interpreting, deciding, acting and learning, think of RPA as your own private ‘virtual’ workforce. RPA is a series of solutions aimed at leveraging software (or ‘robots’) to assume the everyday process-related tasks previously requiring significant amounts of human involvement, such as processing transactions, manipulating data, and/or actions tasks as part of workflows. 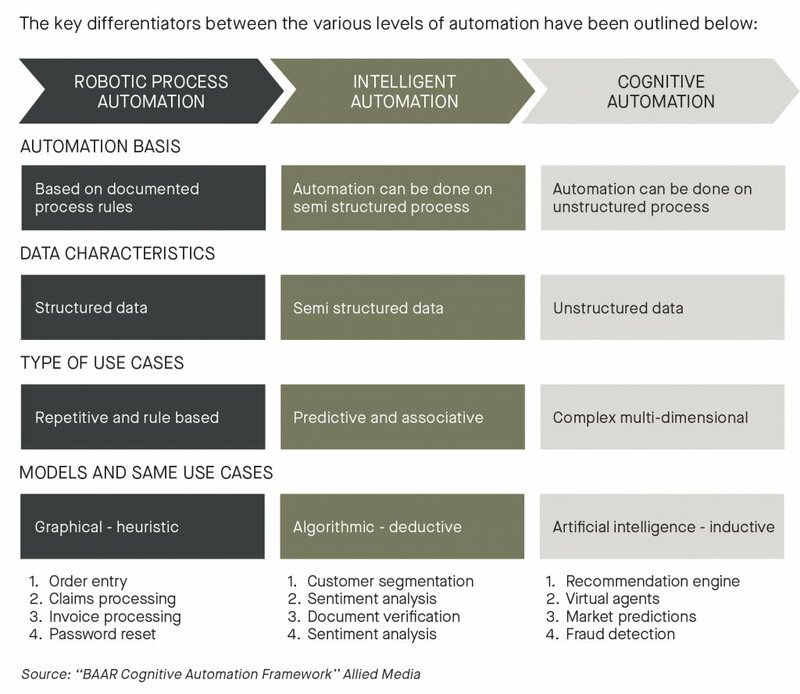 Robotic process automation attempts to replace the need for human involvement with systemic, repeatable, scalable solutions which perform the same repetitive, rudimentary tasks longer, quicker, and more efficiently. Why choose Robotic Process Automation? Use Case – Hire to Retire : IT personnel are no longer needed to manually manage the process for provisioning/deprovisioning access to systems. A robot would be configured and programmed to monitor for access requests in the company’s ticketing system, validate the request was authorized, log into appropriate systems (such as Active Directory, SAP, etc. ), set up the user with the necessary accesses, log out of the system, update the ticket, and send an email notification to the key stakeholders. Gone is the need for your IT personnel to manually perform these steps and free them up to perform other high-value activities. Use Case – Invoice/Order Processing : Finance personnel would no longer be required to spend hours logging into systems to select the appropriate order/invoice form, input information, and post invoices/orders for processing. A robot would be configured and programmed to log in, select the necessary template, interact with other systems (such as those storing previous invoices/orders or client information), input/extract information, and post completed forms for processing. Coupling RPA with Optical Character Recognition (OCR) and ‘cognitive’ automation can further increase the confidence intervals over time to reduce false-positives, allowing your resources to spend more of their time doing your most valued activities. However, despite the numerous benefits of RPA (with some suggesting that your return on investment can reach almost 200%), in order to be truly effective in your organization, it requires proper design, planning, implementation, and governance. At Richter, we not only focus on ensuring your compliance needs are met, we evaluate your entire security strategy to ensure your processes are running optimally. Founded in 1926, Richter is one of the largest independent accounting and consulting firms in Canada, with 60 partners and 500 employees. Richter serves clients from its offices in Toronto, Montreal, and Chicago and offers services in the areas of audit, tax, consulting, and wealth management. Our Risk, Performance, and Technology Advisory Services group is composed of over 30 professionals in Montreal and Toronto who offer expertise in areas such as cybersecurity and information security, governance, internal control, IT and performance improvement advisory, fraud risk management, and finance. A disciplined, data-driven approach and methodology for eliminating defects in any process – from manufacturing to transactional and from product to service https://www.isixsigma.com/new-to-six-sigma/getting-started/what-six-sigma/ .